With the help of a prosthetist, friend, and co-inventor Zach Harvey as well as feedback from others, we came up with the Stump Armour concept. This was based on my original idea of this low profile device that could be bolted directly onto industry standard prosthetic components. I am a combat wounded Marine with bilateral trans-femoral (double above knee) amputations. The development of this foot began whilst trying to find a better way to do mechanical work on the ground after injury. Every prosthetic foot that I had got in the way and I had to take them off. I also moved around on a moving dolly and creeper but my driveway was not level making working difficult. While using dolly and creeper I had to dismount to the ground so I would be able to apply any sort of pressure. I decided I needed a round foot that would allow me to walk as close as possible to the ground, on my nubs, and make getting up and down as effortless as possible. This maximizes mobility while reducing stress on the back. 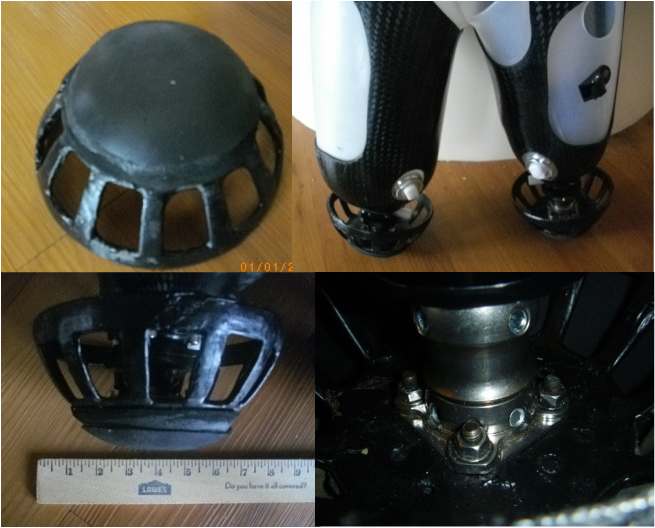 I have now utilized Stump Armour in a myriad of tasks to include climbing ladders, climbing/descending steep trails, traversing loose soil on construction sites, forward/backward rolls, flipping logs, climbing piles of lumber, and I am always exploring more uses of this multipurpose foot design. 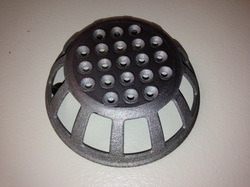 Casting these parts has become the best option for manufacturing. We currently have stainless steel as the primary option and silicon bronze is also on the list. The new design for weaker alloys is complete and light weight Aluminum pairs are available. We are using polyurethane elastomer for the round bottom piece of the foot to replace the dense foam pictured on the prototype. For traction the whole thing gets encased with Rhino Liner. It is now sprayed on chunky to provide more traction. COMPLETELY RUBBERIZED (OR EQUIVALENT) MODEL FOR USE INDOORS, ON BOATS, AND POSSIBLY ROOFS.